As you can see, the minor creases and some of the spotting have been removed from the original photo. The lighting and light color in this photo has been brought back to its original quality - if not better. 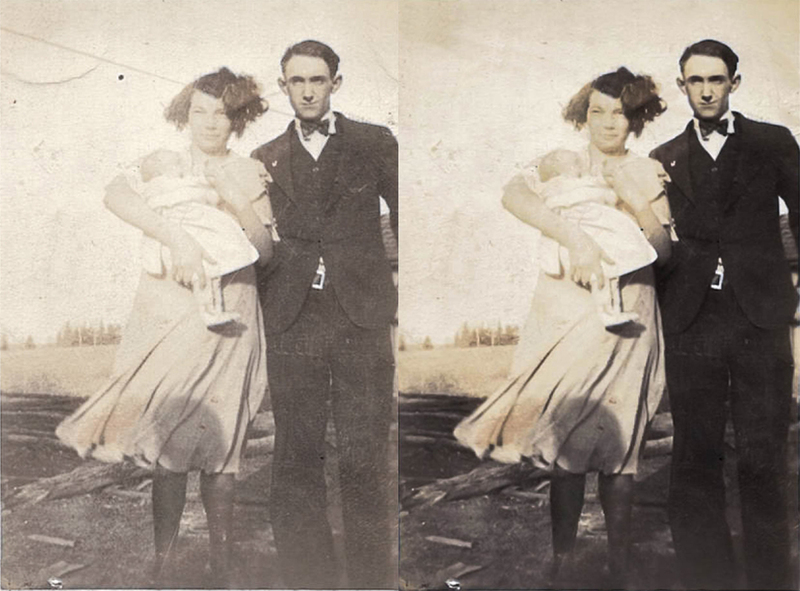 These types of images require more time and effort put into the color and lighting correction and usually take 20-30 minutes per photo to edit and restore them. Cropping, blemish correction (such as pimples or red eye), and simple reconstruction (such as minor stains or faded spots) are also included. You will receive a copy of the photo(s) digitally through email or a flash drive provided by you, and you are welcome to print them wherever you'd like. Prints are, also, available through K-jet Studios for an additional fee. Pricing Starts at $7.50/photo or $50 for 10 photos. Contact K-jet Studios for inquiries at kjetstudios@gmail.com. *K-jet Studios has the deciding power over what constitutes as a Simple, Moderate, or Major repair but will always inform the client before the repair takes place should the client decide to decline it. **Some photos have the possibility of being too damaged to repair. K-jet studios does not guarantee a photo can be fixed and will refund payment for the repair should the photo be un-repairable.